Great Shift TG Captions: 5/21/17 - 5/28/17 - TG Captions from The New Great Shift Captions! Randall had spent two awful weeks stuck in the body of that filthy cab driver. He wasn’t sure why the cab was magic or how it swapped bodies, he was just glad to be free from it. The only thing he wanted to do now was go back home and relax in his own bed. He didn’t even care whose body he was in now, nor did he care as he hailed another cab, unphased by his previous taxi trip. Of course, he hadn’t really thought all this through. After losing his body to the magic taxi two weeks ago and now that he was in a new body, he certainly no longer had keys to his old apartment. Plus, he didn’t anticipate that the previous driver took over his life pretty seamlessly. Randall overcame the first obstacle by ringing the bell and knocking furiously. He was a little taken aback when his former body opened the door. It got worse when his old body started laughing. Louis stopped as he looked at his reflection in the window of the store display. He was shocked at what looked back at him. The reflection wasn’t his! He was a woman! How was this possible? When did this happen? He didn’t seem to recognize her, but maybe he had seen her walk by him earlier? It was all so much for him to wrap his head around. Swapping bodies or transforming into a woman didn’t even seem possible, yet the evidence was looking back at him. He tried to breathe deeply to calm down. But then his gaze diverted from his reflection to a cute little dress in the store. He bet this new body would look cute in that! He started to forget about the fact that he had a new body, and started to get excited about shopping for it! 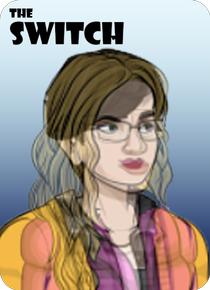 When Alan was cursed by a witch, she swapped his body with a woman’s. She said he needed to understand women better and “walk a mile in a woman’s shoes.” Well, Alan could only presume she meant that in a figurative sense. For the past week since the swap, Alan had been walking every chance he got. He easily walked ten to twenty miles each day, but yet he was still stuck in the body of a woman. He had literally walked a mile in a woman’s shoes a hundred times over, but he was still stuck. His only hope was to find the witch again and beg her to change him back to himself. Jason heard his name called at the coffee shop, and he picked up the cup he saw on the counter. He neither heard the other name called nor did he notice the other cup next to the one he grabbed. One sip and he knew something was wrong, but as the liquid swirled in his mouth, it began to stop feeling wrong. Instead of returning it, he kept drinking. As he did, he noticed a woman in the store wearing a blue coat. She began to change...into him. At the same time, Jason began to change into her. Though he was oblivious, as he was focused on her. By the time he realized his own changes, he knew it was already too late. He looked at the name on the cup. It said “Elizabeth.” He could only guess that’s who he was now, and that she was now him. He wondered if he should be worried, but he couldn’t seem to get himself worked up about it. He just accepted it. He was Elizabeth now. He couldn’t do anything about it, but he still wished he hadn’t picked up the wrong cup. Jeremy decided to make the best of the swap. He was a woman now, and he was going to have to deal with it -- thought it certainly was harder than he expected. The hair was often getting in his face, so he had to pull it off to the side constantly. Then there was still the breasts. They were just so heavy. He wasn’t sure he was ever going to be able to get used to them. Heck, he wasn’t sure if he they weren’t going to just knock him down from time to time; they were just that heavy. Jeremy didn’t know what caused it, but he somehow swapped bodies with a woman walking down the street. She didn’t seem to notice, as she just kept walking down the street with his body instead of her own. Jeremy, however, noticed right away. He slipped behind the house and then began to examine himself. But there wasn’t much he had to do. He could feel all the differences almost immediately. He could feel the breeze on his bare legs beneath a short skirt. He could feel the long hair flopping about on top of his head. But most of all, he could feel the intense weight on his chest. He started to wonder how he was going to manage with these things. He also wondered if maybe the reason the woman kept walking while not noticing was because she was actually glad to be rid of them.